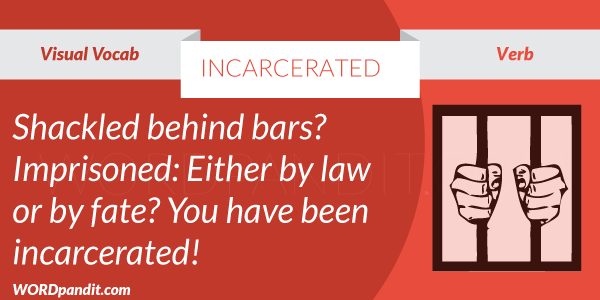 Incarcerate is to put someone behind bars, in other words, to lock them up in jail. It is not only in jail that people are locked up. They can be even locked up in their houses. It depends who the adjudicating authority is. If it is one’s parents, then one is likely to be incarcerated at home. Incarcerate is derived from the Latin word ‘carcer-’, which means ‘prison, jail; an enclosed place’. Carceral State: A state designed like a prison which is known as a “police state”. A carceral state is one that seeks to know everything about its inhabitants and visitors, but hides everything about itself. It demands transparency of everything except its own operations. 1. To put into jail. 1. Naughty children need to be incarcerated.